Mrs May, who spent the day holding talks with French president Emmanuel Macron in Paris and German chancellor Angela Merkel in Berlin, has been making the case for a delay until June 30. 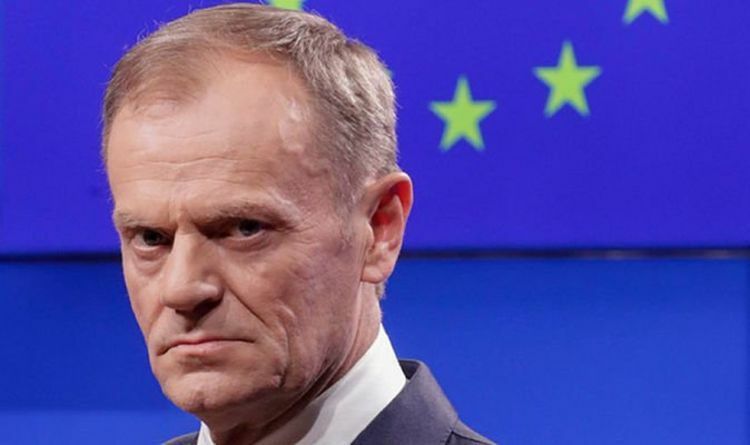 But European Council President Mr Tusk, in a letter to the heads of the 27 remaining member states ahead of a crunch summit on Wednesday pour cold water on her plans. He said there was "little reason to believe" the ratification of Mrs May's twice-defeated Brexit deal could be completed in accordance with her timetable. Instead, Mr Tusk called for the European Council to discuss an alternative, longer extension, such as a "flexible extension" lasting "as long as necessary and no longer than one year". He wrote: "The flexibility would allow to terminate the extension automatically, as soon as both sides have ratified the Withdrawal Agreement. Draft conclusions set to be ratified tomorrow suggest leaders will set as a condition the UK’s participation in the European Parliamentary elections next month - with the threat of being kicked out on June 1 without a withdrawal agreement in place if it fails to do so. The visits to Mrs Merkel and Mr Macron came as the EU's chief Brexit negotiator, Michel Barnier, said Brussels could amend the Political Declaration on future relations with the UK "within a few hours or days" to incorporate the customs union arrangement being discussed in cross-party talks between the Government and Labour.